Word Of Knowledge Radio Show covers a diverse outlook about real life topics involved in the everyday life of Christianity while given you an earful of great music! With a structured format that includes powerful segments, W.O.K.R. is not only inspiring, but also thought provoking! From interviews with some of the hottest CHH & R&P artists today to leaving you with a word of knowledge at the end of the show, it’s really worth tuning into this show. 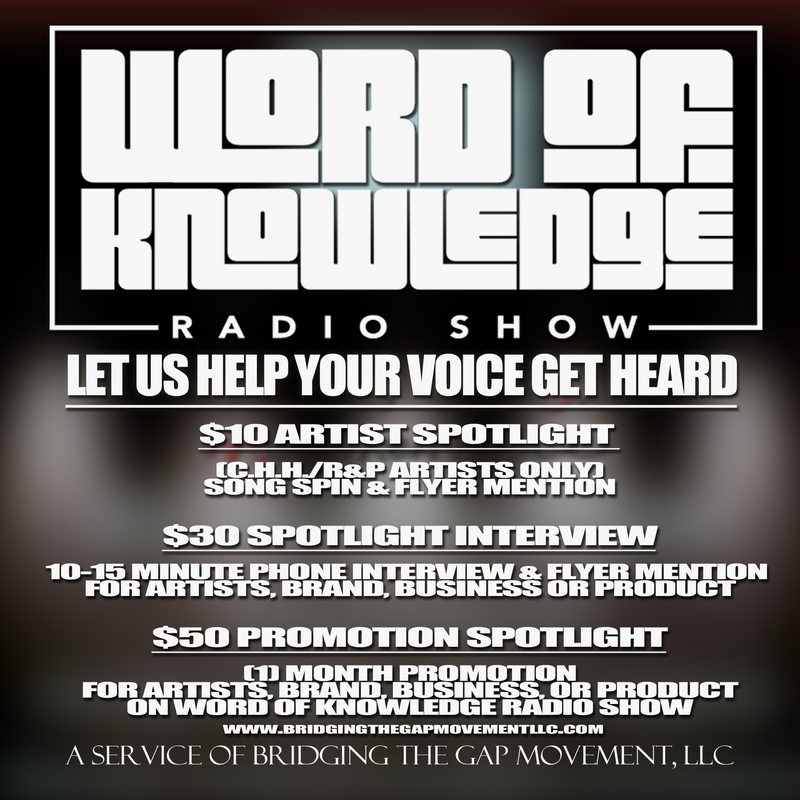 Word of Knowledge Radio Show is an internet based radio show hosted by Radio Personality/Recording Hip-Hop Artist K.N.A.-L.E.D.G.E. alongside co-host Pastor Tim Moses. Upload a high resolution photo of artist(s), brand or product. Word Of Knowledge Radio Show will not air or advertise anything that's offensive or contrary to the Word of God. Upload radio spot in mp3 format. All prerecorded commercials must be Radio Ready (studio) quality! (30-60 sec.) B.B.R. Broadcasts require all aired material to match quality. Word Of Knowledge Radio Show will not air or advertise anything that's offensive or contrary to the Word of God. Upload mp3 with embedded name of artist and title of song. Word Of Knowledge Radio Show will not air or advertise anything that's offensive or contrary to the Word of God.